Wash your hands with soap and water frequently or use hand sanitizer and be sure to ask your healthcare workers and visitors to do the same. Also, it is important that you sneeze and cough into your elbow not your hands. As a surgical patient you will want to make sure to follow the pre-surgery shower protocol with a germ-killing cleanser and to take your medicines as directed to ensure maximum infection prevention. Ask about safe injection practices. Remember: one needle, one syringe, only one time. Everyday, ask if you still need your catheter. 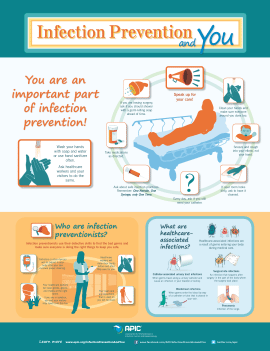 Healthcare-associated infections are a result of germs entering your body during medical care. For example catheter-associated infections occur when germs travel along a urinary catheter and cause an infection in your bladder or kidney. Nebraska Spine Hospital has an industry leading record of zero catheter-associated urinary tract infections for over two years. Surgical site infections occur after surgery in the part of the body after surgery has taken place. Nebraska Spine Hospital has exceptionally low surgical site infection rates. Bloodstream infections occur when germs enter the bloodstream through the tube in your vein or arm and pneumonia is an infection in the lungs. Infection preventionist use their detective skills to find the bad germs and make sure everyone is doing the right things to keep you safe. Nebraska Spine Hospital is a small specialty hospital with an excellent infection prevention tract record that repeatedly has excellent and safe patient outcomes.